But unlike the rest of us, James is in a perfect position to get answers–something he does every week as a professional product reviewer. And recently, he reviewed the CHANGE bike. 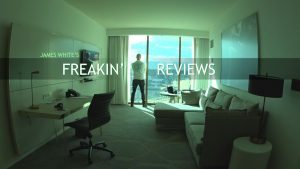 Freakin’ Reviews has over 200,000 followers and 39 million views of his product investigations. 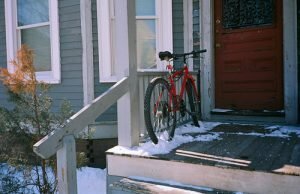 So…how convenient is a CHANGE commuter bike? 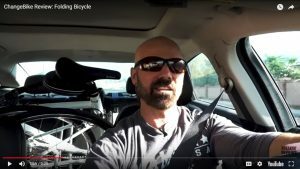 The model he chose to review was the CHANGE 702 commuter bike, which is also the model we recommend to students for its urban sport potential and ability to fold small very quickly–even fitting in the back of a Smart Car. What attracted him to the CHANGE bike was the ability to easily get out of downtown Las Vegas and out to safe places to ride. 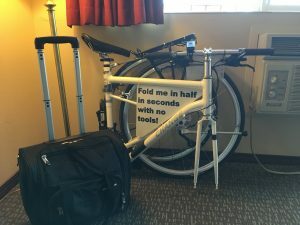 …and how easy it was to drive to safe cycling areas with a bike in his back seat. In all, it was a very positive perspective, but he didn’t focus much on components and price. That’s an open question, so let’s do that now as a technical follow-up. Is this bike worth the price? Bikes today range in price from brick-like “high tensile steel” $200 Walmart bikes to carbon fiber racing bikes that cost $10,000 and up. Once you get into a mid-range choice of materials, such as aluminum, the construction methods become important. Higher-end bikes will be built of tubes that have been narrowed inside for weight savings, but kept strong for welding at the ends. This is called double-butting, and the CHANGE 702 commuter bike does this to keep its weight down to 23 pounds. But it keeps that low weight while remaining strong. CHANGE bikes are the only folding bikes in the world that are destruction-tested and certified for ruggedness. CHANGE mountain frames pass the EN-14766 MTB test. The CHANGE 702 passes the EN-14781 road frame test. 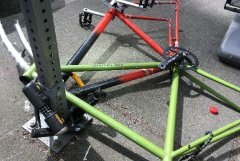 Once you’ve got a great frame, what components are on it? The Japanese component company Shimano has elevated componentry to a science, with front and rear derailleurs, brakes, and gearing all combined into groupsets designed to work well together. Shimano groupsets range from proven and tested 8-speed Claris rear derailleurs to newer, more advanced, and far pricier 12-speed derailleurs. It’s not unusual to find a high-end groupset costing $800 by itself, without the bike! You can spend as much as a CHANGE bike on the drive train alone. But should you? The CHANGE 702 has a Shimano Claris groupset. Like its more advanced cousins, Claris has rapid-fire index shifting. So what do you lose with Claris? Surprisingly, it’s not the range of gearing, which tends to remain the same across systems. Instead, you get larger jumps; so if you wanted to select a 14-gear sprocket, you might have a choice of only 13 or 15 with Claris. And yet, you can still climb the same steep hills, while saving hundreds of dollars. To us, quality also means making practical, budget-conscious decisions about what performance components to include. What can you do? The real price comparison. Ultimately, your purchase isn’t about specs. It’s about what you can do with this bike, and whether it’s worth $1,180. So let’s make some quick, real-life comparisons based on what you might want to do with a CHANGE bike. And it isn’t just about what people do to your bikes. Weather happens every day. If you’re storing your bike outside like this, it’s only a matter of time before it’s rusty and useless. That’s a conservative estimate of $360/month. $1,180 = 3 months of car ownership. After that, it’s all savings. 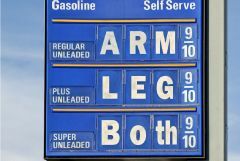 Gas is unpredictable, but hardly your only car expense. After the initiation fee, the average health club monthly fee is $50, and there’s a 70% chance you’ll use your membership far less than expected after the first six weeks. A CHANGE 702 pays for itself in health savings after two years–and if biking is built into your commute, you’ll do it for longer, and be healthier, with all the benefits that come with increased health. What do you want from your next bike? Ultimately, the idea isn’t about how this bike fit’s into James White’s life, but how it fits into yours. 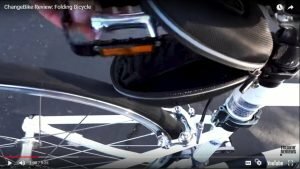 How can a CHANGE bike change your life? Freedom from spending on a car? Freedom to use your bike with cars? Better health? When are bikes faster than cars?